For Puerto Rico native Jay Rivera-Herrans, choosing a major he loved wasn’t easy. He turned that struggle into an original musical. 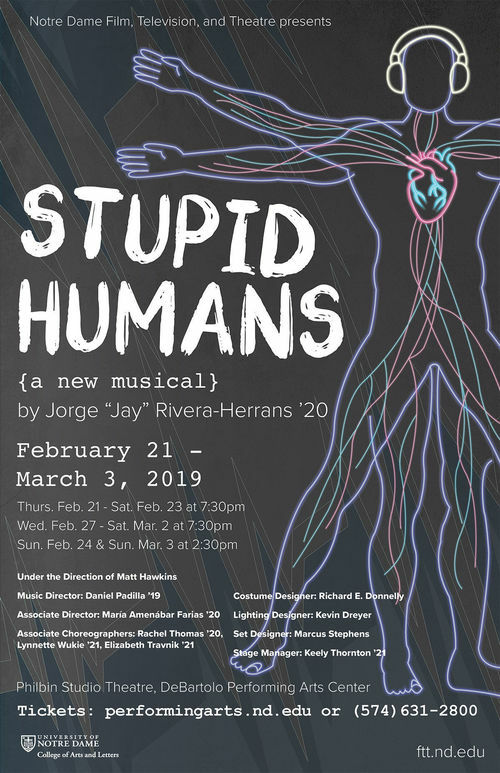 Jay Rivera-Herrans wrote the book, lyrics, and music for — and stars in — a new musical, Stupid Humans, which opens Thursday. 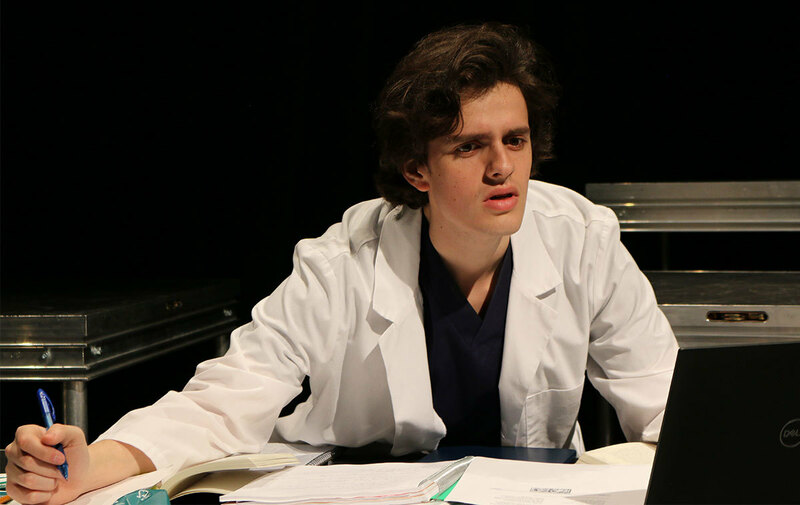 The show is the semi-autobiographical account of a student who discovers his passion is for music, not medicine. A dozen Notre Dame students are huddled around a keyboard at the back of the Regis Philbin Studio Theatre on a snowy Sunday night. On cue, the music starts and the ensemble starts chanting, “Won’t give up, won’t give up,” while one student stomps to the beat in Converse tennis shoes. After running through the song twice, they head to the stage to rehearse it again with choreography. As the group fans out, one young man takes center stage. “I’m exuberant, tenacious, and a med school dropout. You might think of me as just a cop out. But in reality, I love to sing and write. It’s part of who I am,” he sings. Like the character he created, Jorge “Jay” Rivera-Herrans is exuberant and tenacious, but no one could mistake him for a cop out. A junior film, television, and theatre major, he has written the book, lyrics, and music for a new musical — Stupid Humans, which opens Thursday and runs through March 3 — and is also playing the leading role. As the song fades out, the cast moves directly into one of the most pivotal scenes of his semi-autobiographical work, which Rivera-Herrans drew from a difficult conversation he had with his own father about his academic plan at Notre Dame. Matt Hawkins, director of Notre Dame’s new musical theatre program and Stupid Humans, stops them for a moment to offer guidance. “Everyone, we might know that Indigo dropped out, but we don’t know how dad is going to react. That’s how we can share in that tension,” Hawkins said. Growing up in Puerto Rico, Rivera-Herrans knew he was going to be a doctor. In high school, he was president of the Medical Youth Club and accumulated more than 200 hours shadowing surgeons over the course of three summers. 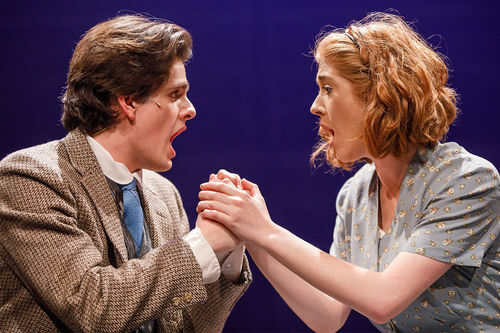 Rivera-Herrans, in a scene from FTT’s 2018 production of Spring Awakening. When he came to Notre Dame, he chose a science-business major and began to tackle his pre-med requirements in his first semester. But he also discovered PEMCo, a student-led musical theatre group, and on a whim, auditioned for their production of Grease and was cast as Doody. Rivera-Herrans, who had acted in a few shows in high school, began to realize just how much he enjoyed theatre. In his second semester, Rivera-Herrans found he was looking forward to his new FTT classes in a way he never had other coursework. But like Indigo, he did not tell his parents about his new plan until a few weeks after he’d made the switch. Feeling isolated and afraid of disappointing his family, Rivera-Herrans turned to writing. In his sophomore year, Hawkins — an acclaimed Chicago-based theatre director — joined the Notre Dame faculty, and Rivera-Herrans enrolled in two of his classes. One day, when Hawkins asked each student to perform a song from any musical, Rivera-Herrans took a risk and decided to sing one of the songs he’d written himself. Rivera-Herrans (right) rehearsing a pivotal scene in Stupid Humans with Mario Simone, who plays the main character’s father. Hawkins and Rivera-Herrans began meeting weekly to discuss the musical, and Stupid Humans slowly took shape. Along with writing the songs and story of Stupid Humans, Rivera-Herrans also landed two lead roles in the span of a few months — FTT’s musical Spring Awakening and the South Bend Civic Theatre’s production of In the Heights. Seeing his son thriving in his new major, Rivera-Herrans’ father began to come around. He also visited Notre Dame to see his son in both shows last spring. Last fall, Hawkins taught a musical theatre lab course where students workshopped different aspects of preparing Stupid Humans for the stage. Although the costumes, lighting, and set have been designed by FTT faculty, students fill the roles of music director, associate director, associate choreographer, creative producer, and stage manager, among others. Rivera-Herrans, who speaks as if his Notre Dame experience is divided up by shows instead of academic years, isn’t sure what comes after Stupid Humans closes in March. 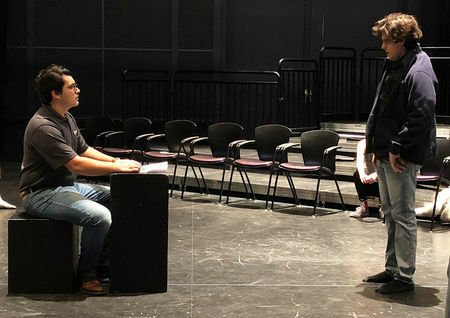 He plans to continue working with Hawkins and many of the students he’s grown close to in this process — and he hopes to share the musical with a wider audience in the future. 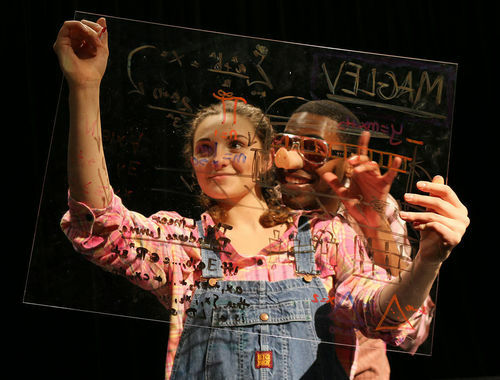 Notre Dame students Rachel Thomas and Samuel Jackson II rehearse a scene from Stupid Humans. His goal for Stupid Humans is simple. “I want to inspire people who find themselves in a similar situation,” he said, “those who are on a path they’ve been pushed toward when there’s something else they want. It’s to encourage those people to make the switch and just go for it — and not to do it halfway, but to just dive in. Originally published by Carrie Gates at al.nd.edu on February 19, 2019.